What season is it now in the Work of God? It is clearly revealed in the Word of God, that His Work today on this earth is to WARN His people! To warn SPIRITUAL Israel or His Church, as well as the physical nations of Israel that they are about to go into CAPTIVITY! Extreme danger is imminent upon the United States and Great Britain as well as the other nations of modern Israel, but ALSO danger is imminent upon God’s own people or Church, and the VAST MAJORITY are asleep! This article will attempt to make it as clear as possible, so that a little child should be able to understand it. The plain truth has always been clear and easy to understand for those with the Spirit of God. The majority of God’s people today are asleep and doing an outdated work or rather a work that has already been fulfilled! Meaning the preaching of the gospel to the world as a witness. That has already been done and is fulfilled prophecy. This has been made plain throughout this website. But they (that majority) will say that the gospel is an "everlasting gospel" as the scripture says. That is true. But the scripture does NOT say that the "PREACHING" of that gospel is everlasting! Christ says in His Word in Matt. 24 that this "gospel of the kingdom will be preached unto all the world as a witness, then shall the end come." We are NOW in that time of the end! So there is a time when the purpose of preaching the gospel would be over. Again what was the PURPOSE of the preaching of that gospel? The scripture says only as a WITNESS! Not to save or attempt to convert people. That time will come later for the "masses" of the world. But the Bible shows that there are different "seasons" of the gospel, or in other words different phases of God’s work within the framework of God’s gospel or truth. But it will ALWAYS be based ON that truth, NOT changing it. So as the great tribulation comes upon us, the truth will STILL be the same, but the "work" of God will enter a different phase as He works through His two witnesses. No other works of men will matter or be important at that time. And that should reveal to us that they are not important now either, IF we listened to and heeded the work that God did in the end time through His Apostle. Many today are trying to "duplicate" the work that God completed through Mr. Armstrong, and they are NOT being blessed! That is because it is NOT God’s Work! So there was a time for the gospel to be preached as a "witness" and that time has been over for almost 21 years. Then there was a time of "final exams" to be a test period for God’s people. That time is now almost up also! We are now entering a time of God’s watchmen, who will give the final and last warning to God’s people before the two witnesses come on the scene at the outset of the tribulation. God ALWAYS has warned His people ahead of time. But still they (historically) have refused to listen. But the warning will go out nonetheless, so they will be without excuse. Mr. Armstrong made it very CLEAR in his last Pentecost sermon of 1985, that the purpose of our being called as Firstfruits was NOT just to be "saved" or to be the first into God’s Kingdom, but RATHER to be called as TEACHERS to help Christ teach the world God’s ways when He does return to set up His Kingdom. Mr. Armstrong also said in this sermon to the ministry and to the members that "WE DID NOT GET IT!". How true that statement turned out to be! This website was created to serve as a point of contact for those who still hold fast to the teachings that God gave us through Mr. Armstrong, as well as to help remind us of the truth and doctrines that have become watered down today by the various "churches of God". But this site as a whole, already serves as a WARNING to all of God’s people, and it will in some capacity serve to warn the United States and Great Britain and other physical nations of Israel of the impending danger that is very quickly coming upon them. Please also take notice of the "audio messages" page. This also contains vital information about this warning. In Ezekiel 33:7, we see where GOD set a watchman for the House of Israel. 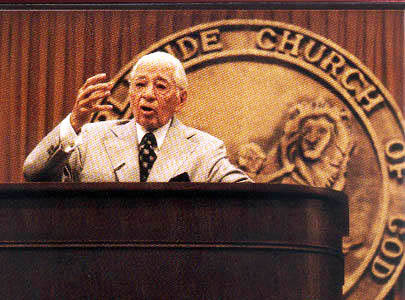 This most definitely was fulfilled by Mr. Herbert W. Armstrong! God Himself set this man to warn the nations of Israel for over 50 years of the 20th century. For three 19 year time cycles (57 years), Mr. Armstrong was a voice crying out in the wilderness of religious confusion of this world. At the same time he sounded a warning to the nations of Israel. During this time, God called people to become a part of His Church and Firstfruits. But that time is now over, therefore the world AND God’s people HAVE BEEN WITNESSED TO! They are without excuse. And what is about to happen on this earth will catch EVERYONE by surprise! But notice verse 2 of Ezekiel 33. In this case, the people of the land, rather than God appointing, look to someone to be their watchman. (other verses show watchmen) And in verse 3 it shows that it is at a time when the watchman SEES the sword coming upon the land! And what does he and those with him have to do? It says there in verse 3, to blow the trumpet and WARN! Does this mean that this watchman is "without" God’s blessing because the "people" looked to or made him their watchman? Not at all, and it does not say that. Other scriptures that tie in with this watchman and the same time period show that indeed God DOES appoint or set this man (or men) as a watchman also, and others with him. Notice Micah 7 and verse 4. It shows a time that the day of your watchmen (plural) and the time of perplexity (tribulation or trouble) come at the same general time! And it is at a time AFTER the "faithful man" (Mr. Armstrong) has perished from the earth! (verse 2). And it SHOULD be a time (verse 1)when the Firstfuits are ready to be harvested, but they are NOT! God says in Isa. 62:6 that He has set watchmen (plural- meaning at least two) upon the walls of Jerusalem (a type of God’s Church). Verse 1 confirms that this is addressed to God’s people (Zion or Jerusalem). Also notice Isa. 52:1 - addressed to Zion and it says to AWAKE, AWAKE! So it’s talking to a people who are ASLEEP! Verses 2 through 5 show the coming CAPTIVITY upon this people, God’s own people Zion! But notice verse 8, which speaks of God’s watchmen (plural) who SEE EYE TO EYE! In other words they are in AGREEMENT! "Two can’t walk together unless they be agreed." Finally notice Jeremiah 6:16 which is an admonition from God to return to the "old paths" (what God restored through Mr. Armstrong). But notice verse 17 which shows that God sets WATCHMEN up at a time when CALAMITY is just about to come upon the whole earth! (verse 19). Verses 18 and 19 show that this message or warning addresses three groups. O nations-(of Israel), O congregation- (God’s Church), then to: O earth!- (the whole world!). This is just before or at a time of calamity or tribulation, so this dates this prophecy! Verses 22 and 23 show the coming captivity from Assyria and verse 23 shows that they are set against the "daughter of Zion" or in other words: God’s end time Laodicean Church! Who is that Laodicean Church? It has been made clear throughout this website and through many scriptures that ALL of God’s people are in the Laodicean condition and ALL have fallen asleep (Matt. 25:5). We are in the seventh and final era OF God’s Church, not just part or parts of that Church. God puts us ALL in the same category. But He also is waking up some who will respond to His call to AWAKE! To annoint our eyes that we may SEE. It is those who are AWAKE who SEE the sword coming upon this land and upon God’s people. God says if you SEE it, then WARN! This now leads to a part or section of this warning that some might call unorthodox or "alarmist" or "doomsayer" or something to that effect. But I MUST present the facts to you, so that YOU can decide for yourself. But first let us be reminded of the things that Mr. Armstrong wrote in the "United States and Britain in Prophecy". That was the most requested book ever published by Mr. Armstrong or the Worldwide Church of God, with over 5 million copies mailed out. It is also one of the most important, especially for this time now! So I would suggest a review of that book to any who want to be more alert to what is about to befall our nations. But also there are other things that Mr. Armstrong wrote here and there that we may have forgotton or overlooked or just never paid much attention to because they were not necessarily "doctrinal" issues. HOWEVER as we proceed, hopefully you the reader, will begin to take notice of these things and compare them to what YOU may or may not have picked up on in the news in the past few years. I will be showing you briefly, some excerpts of what Mr. Armstrong wrote about this, as well as posting some external website links that you can examine yourself - the evidence, and then make your own determination. But as far as I know, NO ONE is tying this "unreported news" in with what God revealed to us through Mr. Armstrong. So this is the goal in this section of the website, and also with some of the audio messages on this website. It is important to remember here, that indeed Satan has deceived the WHOLE WORLD. And I must tell you that perhaps we have overlooked HOW THOROUGHLY he has accomplished this! EVERY SINGLE ASPECT of this society we live in, from the very top echelons of our government all the way down to the private individual and yes that includes God’s own people! The scripture says Satan has decieved the WHOLE (meaning ALL) not just 99.999 % of it. And the scripture says we are fighting this deception at all levels but ESPECIALLY as it says and strongly indicates in Ephesians chapter 6, that we are even fighting against and being attacked from our very own GOVERNMENTS! Some may find this hard to believe, especially if we are the "patriotic" type. I will tell you now, you will not find a more patriotic person than myself, as far as the United States is concerned. I am an ex-Marine and a Vietnam veteran. I offered my life for my country, but it was not taken. Many of my friends and comrades in arms’ lives were taken though. Nevertheless, I gave myself for that purpose, without hesitation, even though now many years later we can see that it was a useless war! And a war that we lost. I try to avoid talking about myself on this website, because I am irrelevant. But I thought it important to mention this about one aspect of my background at this juncture.
" For we wrestle not against flesh and blood, but against principalities, against powers, against the rulers of the darkness of this world, against spiritual wickedness in high places." So does this include even our own governments? Yes it does! And below I will show you PROOF that Mr. Armstrong saw this many years ago and WARNED us about it. Remember, Satan is the GOD OF THIS WORLD! (II Cor. 4:4) and has indeed deceived ALL of it, every single aspect of our society and belief system. All those things we put "trust" in, and that includes YOUR government. ALL the governments of this world are a part of the modern or end-time Babylon, that old system that was begun by Satan himself shortly after the creation of the first humans of this earth. So it is with this understanding that we as God’s people SHOULD have, that I will present the information contained below in this article. If you have God’s Spirit you will be able to discern truth from fiction. And at first some of this may appear as fiction, until you see the groundswell of constantly growing evidence of what is happening "behind the scenes", or more importantly another way to put it…. FROM WITHIN! And if you are just the "average" American or Brit, so to speak, not having any religious affiliation or background, then OPEN YOUR MIND to at least LOOK at the information provided. It will change your perspective! At the very least, to all who look "into" this, you will at least have more to be "aware" of when unusual things begin to happen very SOON in our countries. And you will have been warned ahead of time. How you respond to it or what you do with it is up to you. Now the information below (at the bottom of the page), I must tell you, is NOT an end in and of itself, as some would have it to be. Many are taking a "survivalist" mentality or "stockpile food and money" mentality. That is because they do NOT have, or have REJECTED God’s revealed knowledge about what the OUTCOME will be. It's all right there in black and white in God’s Word, the Bible! It was revealed to us in the end time through God’s last apostle of the Church age who was also God’s Ezekiel Watchman unto the House of Israel who DID give WARNING about this!
" We are not fighting a single nation in a military war, but a gigantic world-wide plain-clothes army, masquerading as a political party, seeking to conquer the world with an entirely new kind of warfare! But of us, prophecy says that we allow ourselves "to be mixed up with foreigners: ... foreigners eat away his strength, unknown to him." God says we fly, like a silly, senseless dove, to seek alliances with foreign nations, forsaking God. (Hosea 7:8-13, Moffatt translation). " "Most Europeans are becoming distrustful of the United States. They wonder why we had the Marshall Plan. WHY are we so beneficent? WHY are we sending them so much money? They can't understand altruism and generosity. They suspect ulterior motives. They are thinking more and more about the coming UNITED STATES OF EUROPE! We Americans, with the British, gave them the idea. We've tried to organize the European nations together against Russia. They are going to unite against us! And now Europe is about ready for it! The stage is all set! All that's lacking now is the strong LEADER -- the coming FUEHRER! The Germans are coming back from the destruction of World War II in breath-taking manner. Germany is the economic and military heart of Europe. Probably Germany will lead and dominate the coming United States of Europe. But Britain will be no part of it! This astounding resurrection of the ROMAN EMPIRE is the very NEXT prophesied event. The world will be dumbfounded when this military colossus actually emerges. That booklet was written in the mid 1950’s. Mr. Armstrong was always ahead of his time and he even stated this. But also, ALL OF GOD’S APOSTLES were ahead of their time! They thought that Christ would return within THEIR lifetimes. Perhaps the only exception to this was the apostle John, whom God used to pen the book of Revelation. But did you NOTICE in the first and second paragraphs of the above excerpt, how he said that this warfare is totally different than any we’ve seen, and it will weaken us FROM WITHIN? That means just what it says! Weaken us from within, from our own government! And have you SEEN those things he mentioned fulfilled the past 20 or 30 years, and even more so since the terrorist attacks on our country? Again he said this would happen: "sapping our strength, perverting our morals, sabotaging our educational system, wrecking our social structure, destroying our spiritual and religious life, weakening our industrial and economic power, demoralizing our armed forces…" Have we seen this happen? You’d have to be TOTALLY ASLEEP to NOT see it, and it’s getting worse by the day! God gave Mr. Armstrong the foresight to SEE what was coming! And he said it was going to come FROM WITHIN! He knew that our own government would be used to WEAKEN us as he stated above, then after that weakening took place, THEN would come the invasion and captivity of our peoples! Brethren and friends I tell you the sword is ALREADY in our land and soon it will be shown in full force! International Cultural Foundation in Pasadena, California. fought and died to secure for us stealthily being taken from us?" the most beautiful campus in America). support the baseless allegations of embittered expelled members. There was no evidence. Hence there was no criminal charge. Now if you go back and read those excerpts again, especially where I underlined certain points, we should be able to clearly see that Mr. Armstrong was fully aware of what is behind the governments of this world and yes even in the United States. Have you looked into or heard of the "Patriot Act" that was passed into law in this country shortly after the 9/11 attacks? In fact it was written BEFORE those attacks by almost a full year, but the attacks on the World Trade Center in New York enabled it to be quickly passed without even being reviewed by Congress or the Senate. This was done because the time we were in was perceived as a national "emergency". More on this will be explained through one of the links at the bottom of this page. You will be amazed at what even some of our Congressmen have said about this! But the excerpts above are only a couple of many more excerpts and articles that will be posted on this website, showing the insight that God gave Mr. Armstrong on this subject many years ago. However, most of us have either overlooked or forgotton these things. But NOW is the time to WAKE UP and REMEMBER these things because they are LITERALLY at our door! So is there evil in our government today? What do YOU think? Or put it another way, is there any GOOD in our government today? Well the question should be: What does GOD think or say about it?! For example take a look at Isaiah chapter one and see if you can perceive or see those things being fulfilled today! But the Bible is FULL of prophecies about the nations of modern Israel and especially SPIRITUAL Israel or God’s Church. The purpose of a watchman is to WARN, especially as he SEES the sword coming! Then it’s up to those being warned to heed the message or not. Below will be posted a link to an interesting article on Germany written many years ago. But it is still up to date, because GOD’S WORD is still up to date! It would be advisable to review it and be reminded of what is ahead of us. But first, below will be a link entitled: "THE ENEMY WITHIN" that will take you to another page on this website that is not listed with the other pages on the left side. Why is it not listed? Because it is important to read this page FIRST so you will be able to SEE for yourself where these things about to be introduced to you TIE IN with what God revealed through His loyal and faithful end time servant Mr. Herbert W. Armstrong. And it should again be noted that these things presented on the page entitled "THE ENEMY WITHIN" are NOT an end in and of themselves. There are many websites listed there from many different types of groups and people. The majority are credible sources and from investigative journalists. I do not endorse their personal beliefs. But what they all DO have is a tremendous amount of EVIDENCE of what is going on behind the scenes in this country. So my purpose in linking to this information is solely so you can be more AWARE of your surroundings as never before. And also as a result you will be WARNED. I would like to thank my good friend Mr. Lowell Vickers for helping me to compile the information in this section of the website. Click below for vital information concerning what is going on in the news "behind" the "news".